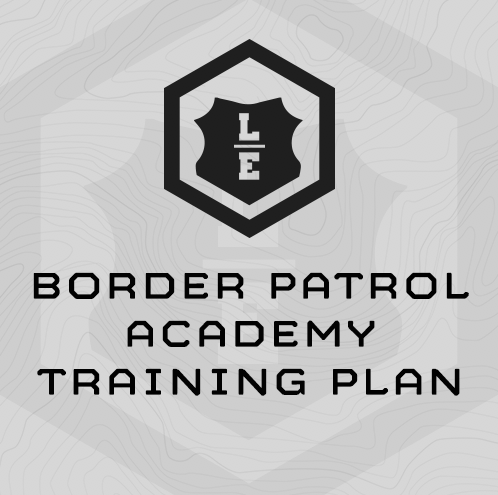 • Designed specifically for those preparing for the Border Patrol Academy. This 7-Week Training plan is designed to prepare you for the Border Patrol Physical Fitness Test and build a solid level of “Base Fitness” for those preparing to enter the Border Patrol Academy. This plan varies from our normal LE Athlete fitness attributes, as you are training specifically to meet and exceed the demands of the academy. Complete the plan in the seven weeks directly before your Academy start date… it includes a “de-load” week so that you are well recovered before checking in to the Academy. Border Patrol Physical Fitness Test II – 220 yd sprint, max sit ups in 1 minute, max push ups in 1 minute, and a 1.5-mile run. Chassis Integrity – Functional, transferable core/midsection strength and strength endurance for mission performance and overall durability. I don’t work a 5 on, 2 off schedule. How should I train? Do your best to train 5 days every 7 day period. You may have to train on an off-duty day and rest on a duty day. Time you started! The weight lifting exercises in this training plan are not complicated or super unique. On our Exercise page, you’ll find videos and explanations of unfamiliar exercises … start there and also search youtube and other resources for exercise tips. Be resourceful. For the barbell-strength exercises, start light and be smart. Keep at it – you’ll get stronger. There’s no hurry. (1) 220 yd Sprint for time. (4) Run 1.5 miles for time. 5x Back Squat - increase load until 5x is hard, but doable. (Example: If you completed 50 Push Ups on your SESSION 1 PFT, you will use that score to find your reps per round. (3) Run 220 yd. for time.